...this Amsterdam directory lists some other web sites about Amsterdam with practical or interesting background information for you to explore. If you want to find out where the hot parties and DJ's are this week in Amsterdam (or elsewhere in the Netherlands), check DJGuide.nl. If you're looking for a business or holiday apartment in Amsterdam, check out this site. 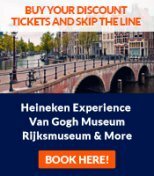 A handy overview of when to travel to Amsterdam, flight information, things to see and do, etc. A portal where you can book various types of apartments in Amsterdam.